How much do you really accomplish in an average day? There are so many people who feel they live unfulfilling lives because they do little more than sleep, work, eat, and sit. Not only can this cycle lead to depression, but it can be dangerous to your physical health as well. Including exercise into your daily routine is a great way to solve both of these concerns, though: regular exercise can boost your mood and your productivity. Exercise gets you motivated in a number of ways to make life more fulfilling, and it provides physiological changes that can add more to your day. Most people don’t work out in any capacity. In fact, they barely move at all, and one of the most popular excuses is that they just don’t have the time to exercise. I’m sorry, but I just don’t believe that. If you take a close look at your day, I doubt it’s packed wall to wall with activity. There are probably a few hours per day when you do very little. Maybe you’re spending them watching television or flipping through a magazine, but even if you like to save these hours for unwinding, finding 30–60 minutes to get some activity shouldn’t be impossible for most of us. And I guarantee that once you find time to exercise, you’ll find yourself with more time to do other things, too. That’s because exercise ends up breeding productivity in other areas of your life. It can increase your overall daily energy, while providing long-term boosts to your brain and overall health. Moderate activity will provide the best benefits. A light 30-minute jog, walk, or anything that gets you up and moving can provide positive results for energy and optimism. You’ll also find yourself sleeping better, improving performance on a daily basis. Exercise can also boost your mood almost instantly. A better mood means you’re more likely to embrace challenges, feel confident, and be willing to lead a more productive and positive life. Physical activity releases dopamine (the pleasure hormone) and serotonin (a neurotransmitter that affects mood), which can reduce stress, improve motivation, and encourage action. The better you feel about life, the more productive you will likely be. Plus, feeling good in one area of your life can be infectious, with this positive outlook likely spilling over into other areas. And when you start seeing the results of your exercise and how it has affected multiple parts of your life, you’ll soon realize what you are capable of and what it’s like to feel good—which is just further motivation to keep active! So how do you get started and keep going? It’s very easy to start an exercise routine, go gung-ho out of the gate, and then see it fizzle out a week or two later. In order to keep at it and be successful, there are a couple of things you absolutely need to do. You might not feel like you’re challenging yourself in the beginning stages of an exercise routine, but it takes your body a little bit of time to wake up and adjust. Therefore, start slow and work your way up. If you come out of the gate too hard, your motivation and energy will fizzle out. The key to exercise is finding a sustainable pace with gradual increases in intensity when you’re ready. Pacing is an essential component of a new exercise routine, and it increases the chances you’ll stick to it. It’s easy to get carried away when you first start out and use adrenaline to carry you a little further; although it’s great at the time, it will eventually result in fatigue and the opposite results of what you wish for. Making exercising a habit is also a way to maintain success. It should become engrained in your daily routine, like changing your clothes before going to bed, or going to work every morning. Pick a time to exercise and stick to it. Some people like to do it first thing in the morning so they have their entire day to focus on other things, while others like to do it on their lunch break to avoid workplace gossip or even after work to decompress. Whenever you choose, work hard on hammering it into your daily life, so it becomes a habit and a natural part of your day. When you realize that you probably have enough time to exercise by swapping it for something else, you’ll soon realize how much you were missing out on and how much time you actually have. 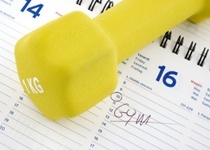 Get more done, feel better, and live a longer, healthier life by including some exercise in your daily routine today. Young, S., “How to Increase Serotonin in the Human Brain Without Drugs,” Journal of Psychiatry & Neuroscience November 2007; 32(6): 394–399. Linden, D., “The Compass of Pleasure,” Psychology Today web site, April 21, 2011; http://www.psychologytoday.com/blog/the-compass-pleasure/201104/exercise-pleasure-and-the-brain, last accessed December 3, 2014. Puetz, T., et al., “A randomized controlled trial of the effect of aerobic exercise training on feelings of energy and fatigue in sedentary young adults with persistent fatigue,” Psychotherapy and Psychosomatics 2008; 77(3): 167–74, doi: 10.1159/000116610.